A funny but yet sad Google Web Search Help thread reports a person receiving phone calls from people looking for taxi service. 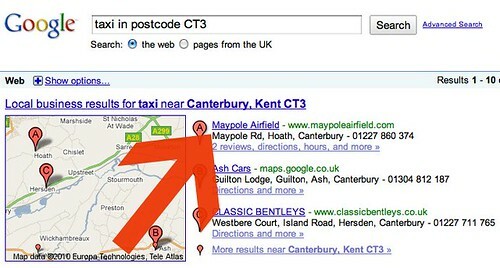 In short, if you search for [taxi in postcode CT3] in Google UK up comes taxi results from Google Maps. But the number listed at the top of the page is of someone's home, who has nothing to do with the taxi service. If you search for a taxi in postcode CT3, the first number that come up is for Maypole Airfield with my home telephone number against it. How do I get this number off the taxi list? The interesting thing is that this is an owner verified listing and thus the phone number was entered by the business owner.